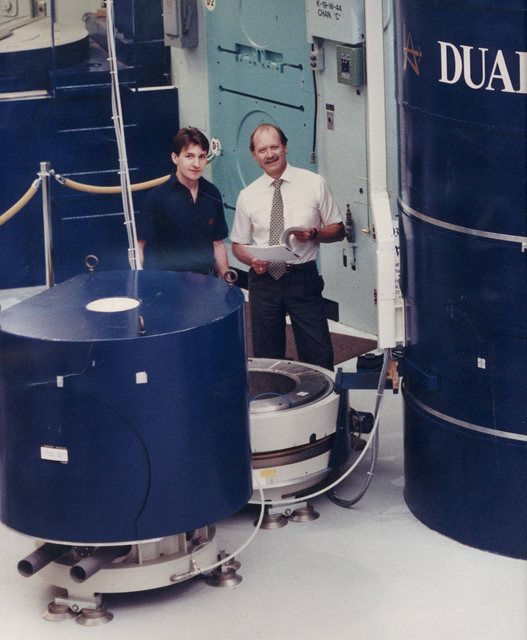 January 1991 opening of the DUALSPEC C5 neutron triple-axis spectrometer and C2 neutron powder diffractometer, NRU Reactor, Chalk River Laboratories, Ontario, Canada. Group photo of opening. A separate identification key is available. The legend gives the following names. 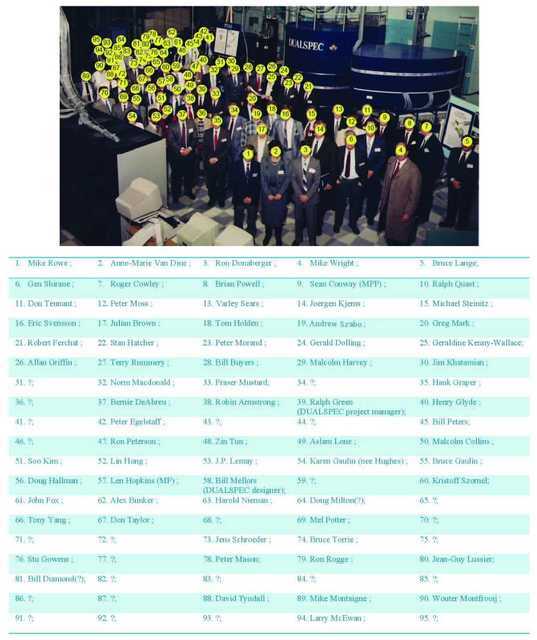 1 Mike Rowe, 2 Anne-Marie Van Dine, 3 Ron Donaberger, 4 Mike Wright, 5 Bruce Lange, 6 Gen Shirane, 7 Roger Cowley, 8 Brian Powell, 9 Sean Conway (MPP), 10 Ralph Quast, 11 Don Tennant, 12 Peter Moss, 13 Varley Sears, 14 Joergen Kjems, 15 Michael Steinitz, 16 Eric Svensson, 17 Julian Brown, 18 Tom Holden, 19 Andrew Szabo, 20 Greg Mark, 21 Robert Ferchat, 22 Stan Hatcher, 23 Peter Morand, 24 Gerald Dolling, 25 Geraldine Kenny-Wallace, 26 Allan Griffin, 27 Terry Rummery, 28 Bill Buyers, 29 Malcolm Harvey, 30 Jim Khatamian, 31 ?, 32 Norm Macdonald, 33 Fraser Mustard, 34 ?, 35 Hank Graper, 36 ?, 37 Bernie DeAbreu, 38 Robin Armstrong, 39 Ralph Green (DUALSPEC project manager), 40 Henry Glyde, 41 ?, 42 Peter Egelstaff, 43 ?, 44 ?, 45 Bill Peters, 46 ?, 47 Ron Peterson, 48 Zin Tun, 49 Aslam Lone, 50 Malcolm Collins, 51 Soo Kim, 52 Lin Hong, 53 J. P. Lemay, 54 Karen Gaulin (nee Hughes), 55 Bruce Gaulin, 56 Doug Hallman, 57 Len Hopkins (MP), 58 Bill Mellors (DUALSPEC designer), 59 ?, 60 Kristoff Szornel, 61 John Fox, 62 Alex Bunker, 63 Harold Nieman, 64 Doug Milton(? ), 65 ?, 66 Tony Yang, 67 Don Taylor, 68 ?, 69 Mel Potter, 70 ?, 71 Ron Child, 72 Francis Temme, 73 Jens Schroeder, 74 Bruce Torrie, 75 ?, 76 Stu Gowens, 77 ?, 78 Peter Mason, 79 Ron Rogge, 80 Jean-Guy Lussier, 81 Bill Diamond(? ), 82 ?, 83 ?, 84 ?, 85 ?, 86 ?, 87 ?, 88 David Tyndall, 89 Mike Montaigne, 90 Wouter Montfrooij, 91 ?, 92 ?, 93 ?, 94 Larry McEwan, 95 ?. 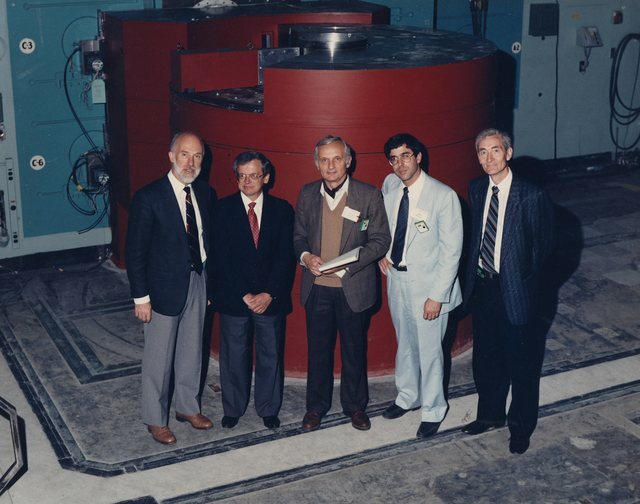 Identification key for the January 1991 opening of the DUALSPEC C5 neutron triple-axis spectrometer and C2 neutron powder diffractometer, NRU Reactor, Chalk River Laboratories, Ontario, Canada. 1 Mike Rowe, 2 Anne-Marie Van Dine, 3 Ron Donaberger, 4 Mike Wright, 5 Bruce Lange, 6 Gen Shirane, 7 Roger Cowley, 8 Brian Powell, 9 Sean Conway (MPP), 10 Ralph Quast, 11 Don Tennant, 12 Peter Moss, 13 Varley Sears, 14 Joergen Kjems, 15 Michael Steinitz, 16 Eric Svensson, 17 Julian Brown, 18 Tom Holden, 19 Andrew Szabo, 20 Greg Mark, 21 Robert Ferchat, 22 Stan Hatcher, 23 Peter Morand, 24 Gerald Dolling, 25 Geraldine Kenny-Wallace, 26 Allan Griffin, 27 Terry Rummery, 28 Bill Buyers, 29 Malcolm Harvey, 30 Jim Khatamian, 31 ?, 32 Norm Macdonald, 33 Fraser Mustard, 34 ?, 35 Hank Graper, 36 ?, 37 Bernie DeAbreu, 38 Robin Armstrong, 39 Ralph Green (DUALSPEC project manager), 40 Henry Glyde, 41 ?, 42 Peter Egelstaff, 43 ?, 44 ?, 45 Bill Peters, 46 ?, 47 Ron Peterson, 48 Zin Tun, 49 Aslam Lone, 50 Malcolm Collins, 51 Soo Kim, 52 Lin Hong, 53 J. P. Lemay, 54 Karen Gaulin (nee Hughes), 55 Bruce Gaulin, 56 Doug Hallman, 57 Len Hopkins (MP), 58 Bill Mellors (DUALSPEC designer), 59 ?, 60 Kristoff Szornel, 61 John Fox, 62 Alex Bunker, 63 Harold Nieman, 64 Doug Milton(? ), 65 ?, 66 Tony Yang, 67 Don Taylor, 68 ?, 69 Mel Potter, 70 ?, 71 Ron Child, 72 Francis Temme, 73 Jens Schroeder, 74 Bruce Torrie, 75 ?, 76 Stu Gowens, 77 ?, 78 Peter Mason, 79 Ron Rogge, 80 Jean-Guy Lussier, 81 Bill Diamond(? ), 82 ?, 83 ?, 84 ?, 85 ?, 86 ?, 87 ?, 88 David Tyndall, 89 Mike Montaigne, 90 Wouter Montfrooij, 91 ?, 92 ?, 93 ?, 94 Larry McEwan, 95 ?. 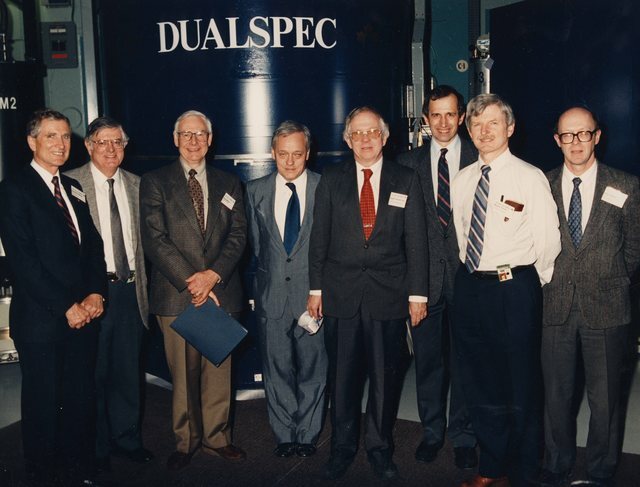 January 1991 DUALSPEC opening: Bill Buyers, Mike Rowe, Bruno Dorner, John Berlinsky, Malcolm Harvey. 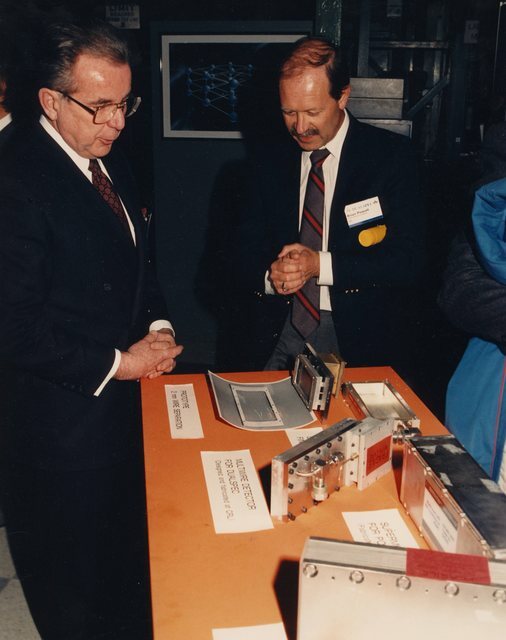 Ron Donaberger and Brian Powell at DUALSPEC circa 1991. January 1991 DUALSPEC opening: Robert Ferchat and Brian Powell. 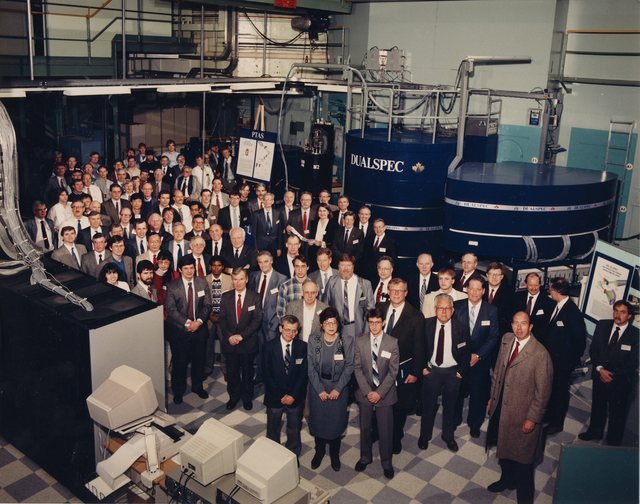 January 1991 DUALSPEC opening. Left to right: Gerald Dolling, Peter Egelstaff, Doug Milton, Malcolm Collins, Robin Armstrong, Doug Hallman, Bruce Torrie and Don Taylor. 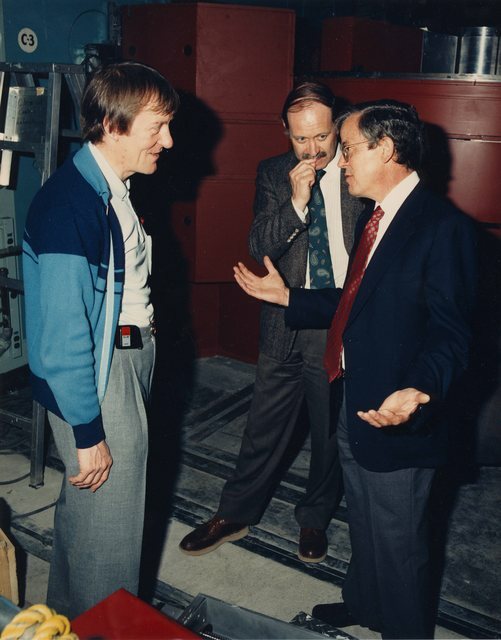 January 1991 DUALSPEC opening: Bill Mellors (DUALSPEC Designer), Brian Powell, Mike Rowe.